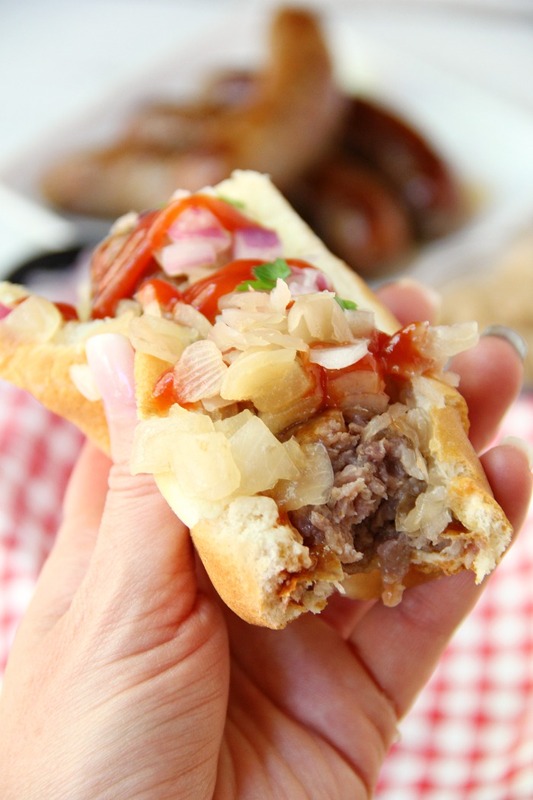 Air Fryer Beer Brats – Brats boiled in beer and onions and then air fried to perfection! The temperatures are dropping and the leaves are starting to change color. Fall is certainly making its entrance. With the arrival of fall, comes football, of course. The first few games of the season have been “nail biters” for sure. Our Green Bay Packers sure know how to keep their fans on the edge of their seats! 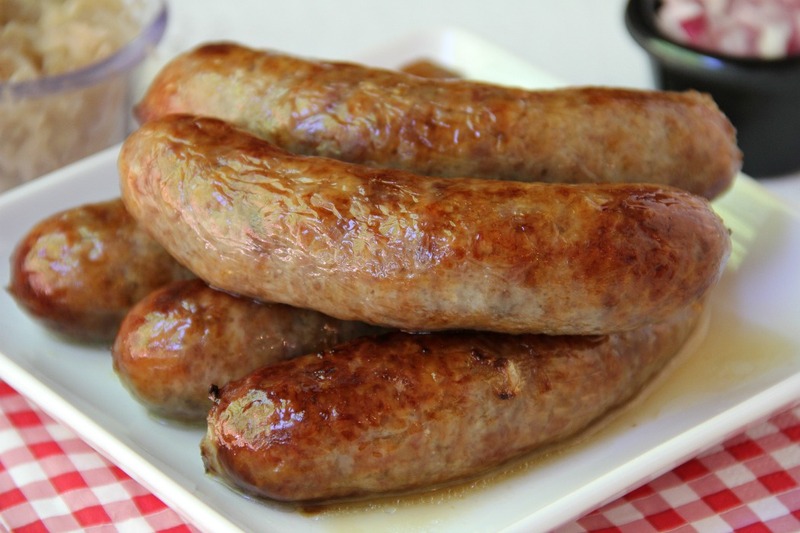 Today, we’re making Air Fryer Beer Brats. Brats here in Wisconsin are a traditional game day food. Paired with a beer and some cheese curds, you have one of the greatest meals of all time. 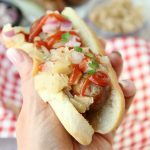 One of my favorite ways to prepare brats has always been outside on the grill, that is, until I tried making them in the air fryer. 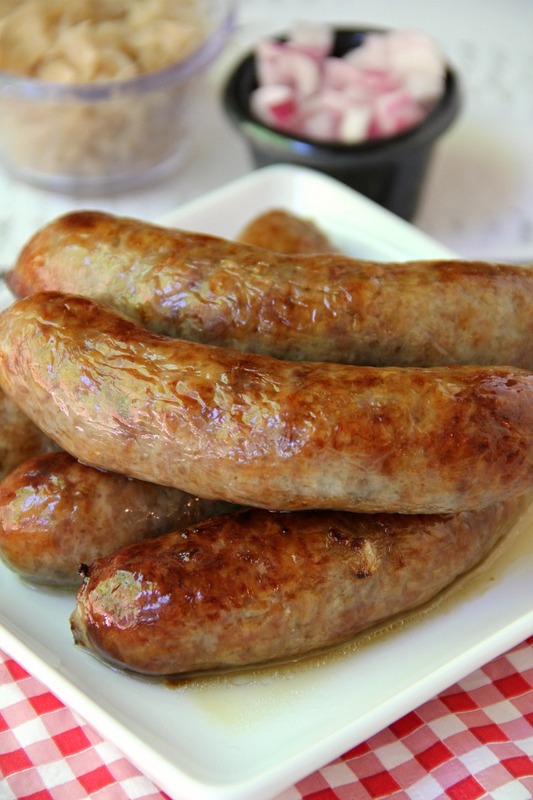 The air fryer cooks brats to perfection, with a golden brown casing and juicy center. I ALWAYS boil brats in beer and onions when I prepare them. Why? Because they’re 10x better and, well, it’s just the Wisconsin way. After boiling the brats in the beer, I transferred them to the air fryer and let them cook for about 12 minutes, flipping them halfway through cook time. When the brats are ready, they look like they just came off the grill! Well, okay, there aren’t any grill marks, but they’re a beautiful golden brown. There’s no hot grill to babysit or clean up. These brats are ready for showtime. Run and get those buns! 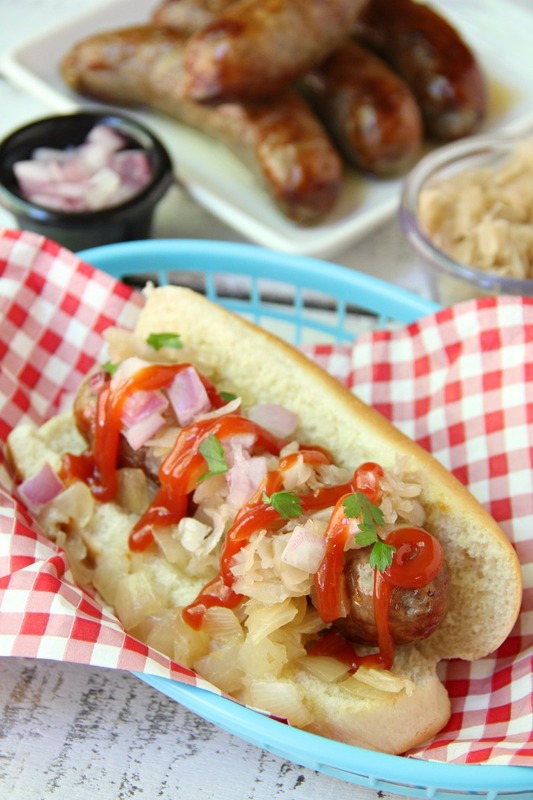 I layer on fried onions, sauerkraut, red onions, ketchup and a little parsley to give the brats a pop of color. So, so good. 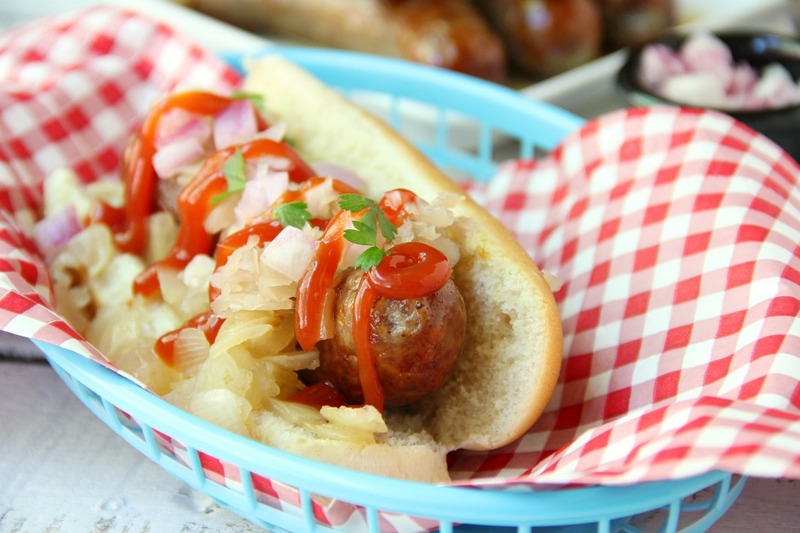 Are you ready to taste one of these air fryer beer brats? Go ahead. Pick it up and take a big ole’ bite. It’s completely okay to have seconds. Hungry for more Wisconsin deliciousness? Brats boiled in beer and onions and then air fried to perfection! 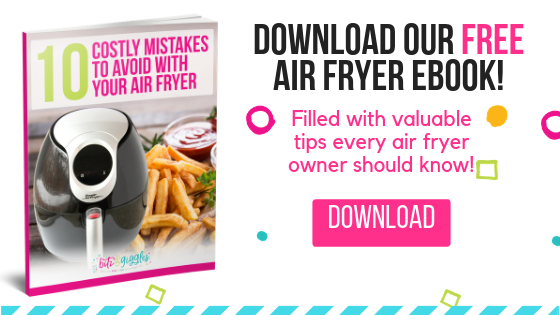 Preheat air fryer to 370º Fahrenheit. 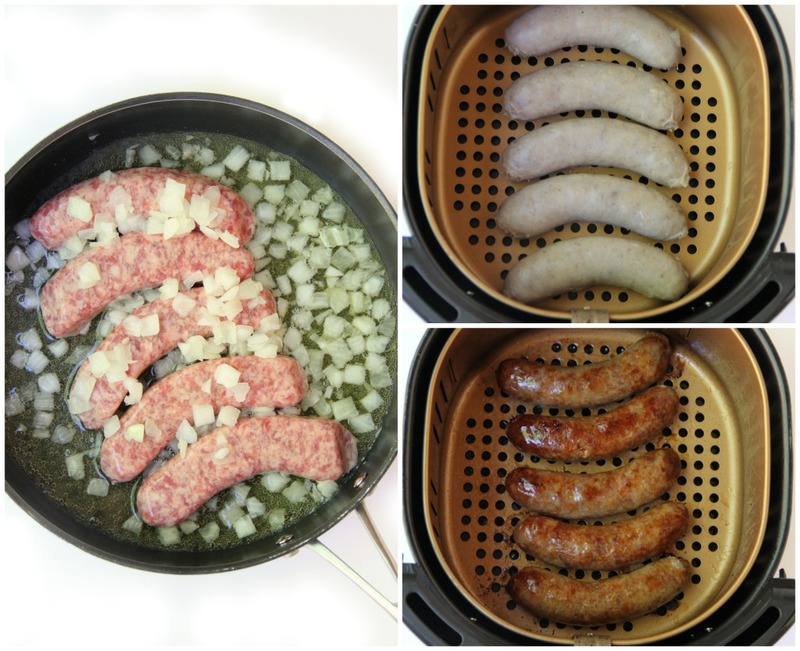 In a large skillet over medium-high heat bring brats and onion to a boil in the beer. Reduce heat, and simmer until brats are cooked through, about 10 to 12 minutes. Transfer brats to air fryer (leaving onions to simmer) and cook for 12 to 14 minutes, flipping halfway through. 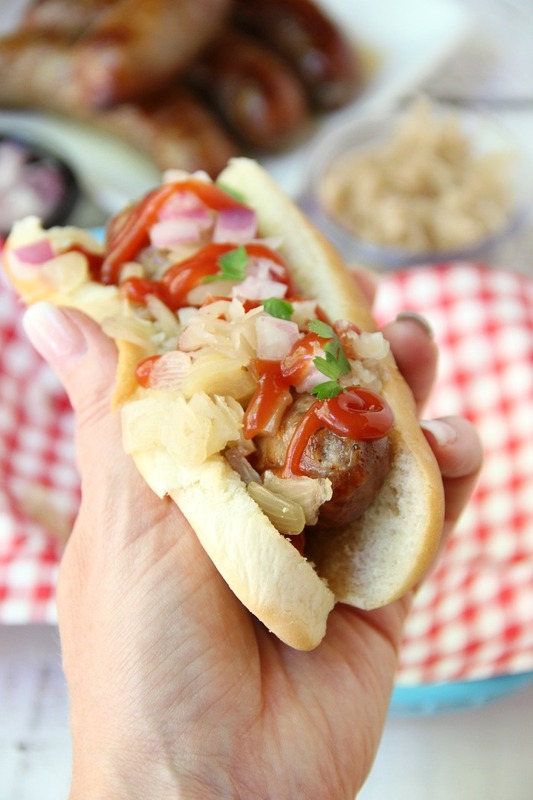 Place brats in buns and garnish with cooked onions, sauerkraut and ketchup.